Parking Lot Standards by "Soldier's Joy"
Hope you all e-flatpickers had a great holiday filled with lots of family, food, and fiddle tunes! Welcome, once again, to my online corner of the guitar universe. 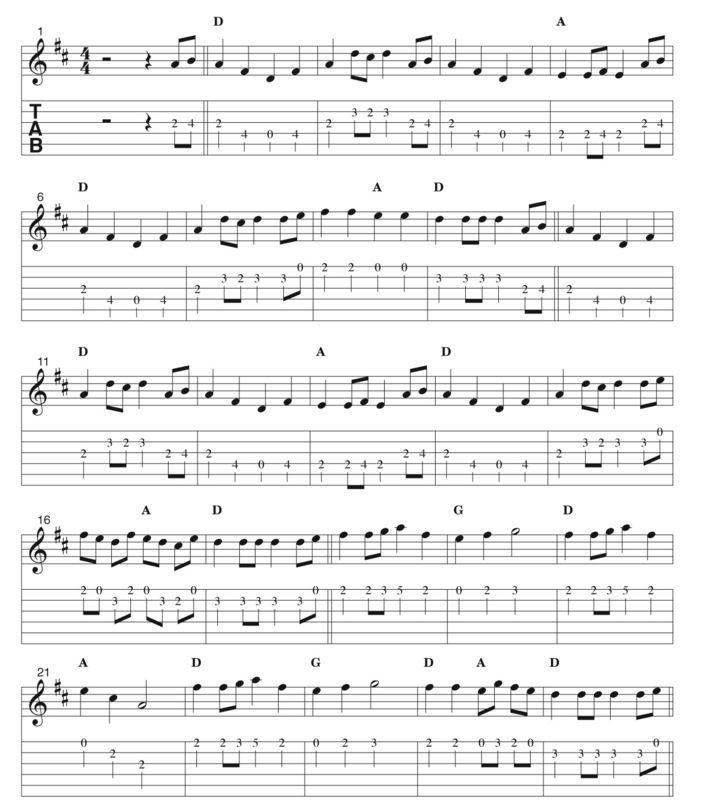 This month I offer an arrangement of a flatpicking mainstay, “Soldier’s Joy.” This tune seems to be a favorite amongst parking lot pickers and I can see why; catchy melody, easy chords, it’s got a good beat, and you can dance to it! I have enjoyed teaching, performing, and recording this tune and I have faith that you too will find comfort in this melody. Many great guitarists like Clarence White, Tony Rice, and David Grier have recorded “Soldier’s Joy” out of “C” position using a capo on the second fret. I do this too, but for this lesson, I wanted to explore the tune without the use of a capo. I’m playing out of open “D” position which lends itself to second position (first finger plays 2nd fret). When playing a D major scale in open 2nd position you will encounter the B note (6th tone in the scale) —many guitarist prefer to sound this note with the open B string, while others like the 4th fret of the G string. I use both in different situations and I encourage you to experiment to see which you gravitate towards. 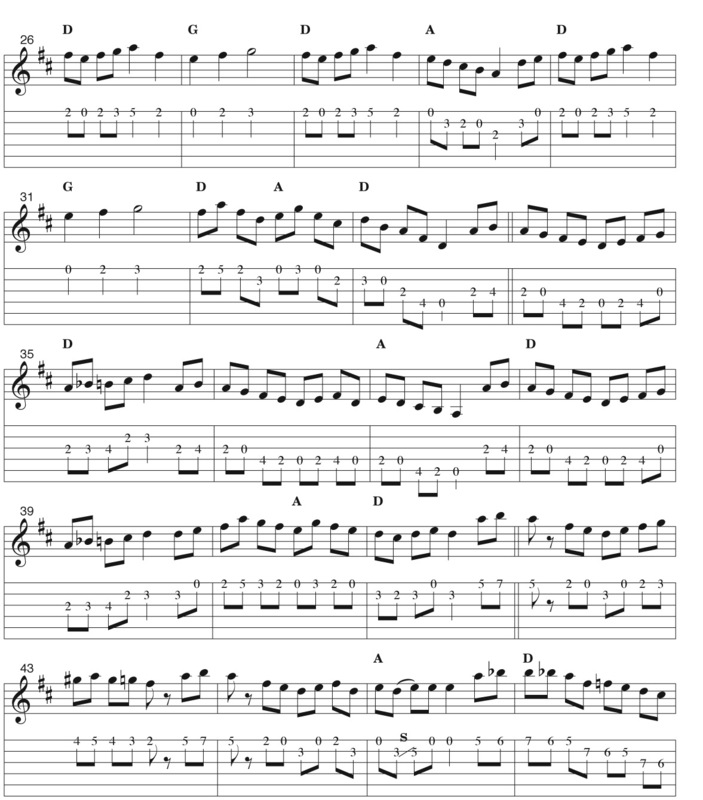 This lesson includes two versions of the tune. The first version contains lots of quarter notes and, to me, really brings out the bare bones of the melody. I like to take this approach to any fiddle tune. Take the time to explore an easy version—one that is completely playable beginning to end. I leave off all slides, pulloffs, and hammers...basically try to express the tunes with as few notes as possible. Once the tune is internalized you can begin branching out to more complex arrangements. 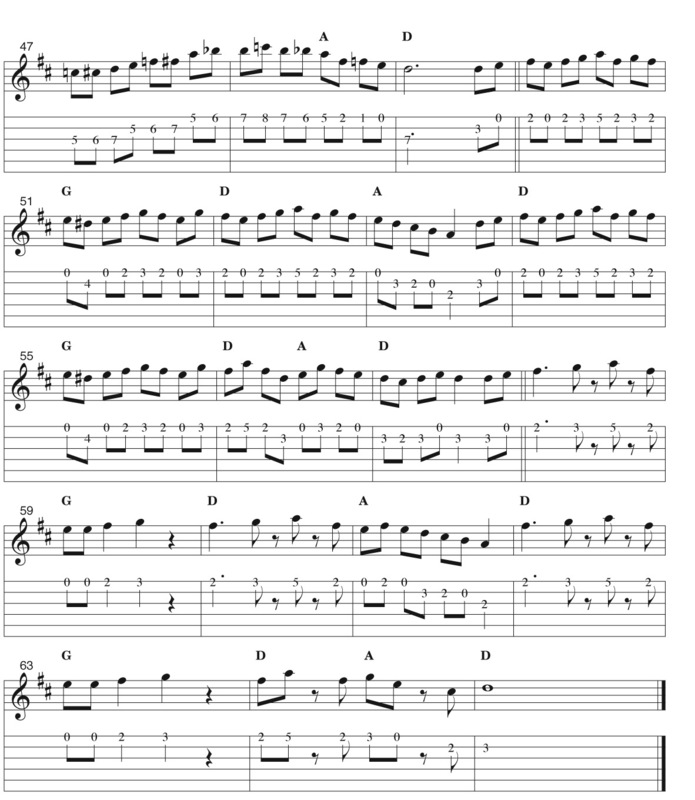 Version two of this lesson is full of eighth notes, alternate picking, and some syncopated surprises! Here is my advice when picking this song or any song—not only should you pay attention to the notes, but also the distance between the notes! (I’ll explain “distance between notes” more in future lessons). Besides being a killer tune, “Soldiers Joy” also has a great history and is played all over the world. My friend Chris Henry told me that in Ireland, where some believe the tune originated, it’s called “Soldier’s Hornpipe.” Another story says that the “soldier’s joy” was his pay, and that some people call this tune “Pay Day in the Army.” Still another story claims that the soldier found his joy the day he returned home from war, and that this tune was played as a “welcome home” tune for returning Cival War soldiers. I have also heard that “Soldier’s Joy” was a name given to the tune by American civil war soldiers who nicknamed their morphine “soldier’s joy.” The 1920’s Georgia band the Skillet Lickers, sang to the melody. and fifteen cents for the beer. now carry me away from here. I find the history of famous fiddle tunes to be fascinating. No matter what you call it or where you play it remember to play with good timing, tone, and taste! Email me at michabraham@comcast.net with any question on this lesson or any ideas you have for future lessons. Thanks for all your positive feedback on last month’s lesson.